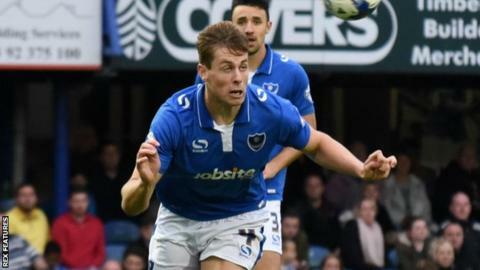 Adam Webster's second goal of the season helped Portsmouth to victory over Cambridge and lifted them up to fifth place in League Two. Marc McNulty gave Pompey a first-half lead, firing in Michael Doyle's free-kick off the underside of the bar. Webster doubled the host's advantage, blasting home after Kyle Bennett's 20-yard shot had struck the woodwork. Luke Berry grabbed a consolation for Cambridge, slotting in after a free-kick from the left side of the box. "I felt we had to put in a performance today with character because it was always going to be a tough game to win. "Apart from conceding a late goal again - which is obviously a problem that we have and it's a disappointing one - the reality of the three points is really pleasing. "Today's about winning. We've played well in the past and not won. The win lifts the whole mood of the place and it's important that I'm the one to do that. "I was brought in to do a job, I'm 32 games in to that; the more we stay together and stay strong the stronger we'll get and the further we'll go." Match ends, Portsmouth 2, Cambridge United 1. Second Half ends, Portsmouth 2, Cambridge United 1. Marc McNulty (Portsmouth) is shown the yellow card. Foul by Ben Tollitt (Portsmouth). Ryan Donaldson (Cambridge United) wins a free kick in the attacking half. Mark Roberts (Cambridge United) wins a free kick on the right wing. Corner, Portsmouth. Conceded by Ryan Haynes. Goal! Portsmouth 2, Cambridge United 1. Luke Berry (Cambridge United) left footed shot from very close range to the bottom right corner. Ryan Haynes (Cambridge United) wins a free kick on the left wing. Substitution, Portsmouth. Matthew Clarke replaces Conor Chaplin. Ryan Haynes (Cambridge United) wins a free kick on the right wing. Ryan Haynes (Cambridge United) wins a free kick in the attacking half. Leon Legge (Cambridge United) is shown the yellow card for a bad foul. Corner, Cambridge United. Conceded by Danny Hollands. Enda Stevens (Portsmouth) wins a free kick on the right wing. Substitution, Portsmouth. Gareth Evans replaces Kal Naismith because of an injury. Luke Berry (Cambridge United) is shown the yellow card.